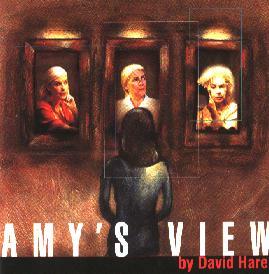 Amy&#146;s View, the David Hare vehicle for Dame Judi Dench currently playing on Broadway, is a stirring, complex play that follows a mother-daughter relationship over sixteen years. The mother is Esme Allen (played by Dench), a famous British stage actress whose strong and imposing personality presents a nice complement to her rather reserved daughter, Amy (played touchingly by Samantha Bond). As the play opens (in 1979), we encounter the twenty three year-old Amy and her new beau, Dominic, awaiting the arrival of Esme at the actress&#146; country home. A playful repartee between the two paints a picture of a couple in love, but we later learn that this relationship is more complicated than the first scene reveals. Esme leads her life quite dramatically, caring little for practicalities. She is from a generation of artists who were able to make a comfortable living in the theater, back when theater had little competition from other forms of entertainment. (Her deceased husband&#146;s considerable estate also helps maintain her in a comfortable lifestyle.) Her daughter, who has grown up in the theater, is in love with an aspiring film maker. As portrayed by Tate Donovan, Dominic is an ambitious, passionate young man who believes that "theater is no longer relevant" to his generation. From Act One, Hare pits Esme and Dominic against each other, with the helpless Amy caught in between. Not only do the two characters dislike each other intensely, but they also stand as symbols of the changing times. Esme looks to reach her audience through language, while Dominic favors visuals and will eventually connect with his audience by shocking them. The play is a study of the three characters. Each act occurs a few years after the previous one and follows the progression of their lives. Judi Dench gives a moving, stellar performance as Esme, a complicated person who has built a solitary life after being widowed. She has little patience for other people and while her dramatics can make her appear flighty, there is no mistaking that she is smart as a whip and has a very sharp tongue. Very few people are ever allowed into her world, especially someone like Dominic who quickly becomes her adversary in the struggle for Amy&#146;s happiness. Tate Donovan presents the audience with a Dominic easily loathed. He begins the play as a driven young would-be filmmaker but quickly develops into a self-absorbed member of the media who places all behind his successful career. In the second act, Dominic is no longer the idealistic artiste. He now hosts a brash television show that attempts to tear down the "arts establishment" with insults and claims that they are "out of touch." Hare makes quite a statement with Dominic, a critic whose anger at the cultural elite is clearly based in a fear of what he does not understand. By his own admission, he has attended very little theater (probably none,) yet as a self-appointed cultural arbiter, feels that he can critique something that he clearly does not understand. It appears that Mr. Hare&#146;s own experience with the media has deeply influenced this character; it is unfortunate and weakens his argument that he has made Dominic not only unlikeable, but also one-sided. Dominic emotionally neglects Amy, who continues to love him, nonetheless. A major problem of the play is that, aside from Tate&#146;s boyish good looks, it is difficult to see the attraction of such a selfish, self-important character. Amy claims to be happy and we are constantly reminded that it is "Amy&#146;s view" that love will conquer all and that one must love unconditionally. It is as though she thinks that her love is enough for all of them. Throughout the four acts it is Amy who tries to bring Esme and Dominic closer to each other. Her attempts to make peace between the two people she loves most backfire, fueling, rather than relieving, the already tense relations between the two. As played by Ms. Bond, Amy is sensitive and selfless, always putting the needs of Dominic ahead of her own. Determined to stand by her man, she is on a path that the audience can easily determine will lead to unhappiness. She seems to find comfort in the role of suffering wife, a reality that would pain any mother who wants her daughter to be happy and cherished. Esme&#146;s constant reminders to Amy that Dominic is not worthy of her love only serve to put a distance between the mother and daughter that grows with each act. Amy&#146;s View is not a perfect play (a contrived reconciliation at the end does not seem plausible and a supposed transformation in Dominic is hard to swallow), but it succeeds due to the strength of the acting and Richard Eyre&#146;s simple, yet quietly beautiful direction. The rest of the cast includes Anne Pitoniak, a scene stealer as Amy&#146;s grandmother and Ronald Pickup (in a badly underwritten part) as Esme&#146;s potential suitor. Maduka Steady stands out and is especially appealing as an eager young actor who appears in the last act. But there is no doubt about the fact that the play belongs to Ms. Dench, arguably one of our greatest living stage actresses. With uncanny timing and extraordinary command of the English language, Ms. Dench dominates the stage and creates a powerful and moving portrait of the aging actress. Dench believably conveys the many layers of the character and effortlessly draws the audience into her world. Esme is a manipulative and domineering woman who has the capacity to betray her daughter&#146;s confidence if she thinks it will protect her. Yet she is also a loving mother who, when asked, gives this same child five thousand pounds with no questions asked. Her transformation from carefree grand dame to a woman who has had the joy stripped from her life (by the play&#146;s end she has been struck by misfortune worthy of a Greek tragedy) is remarkable and heartbreaking. The Act Four Esme is a shell of her former self, yet ironically, within the shell is the true essence of the character. By the last scene, all dramatics and pretense are long gone and for the first time, the audience is treated to an honest look at her soul. The quiet dignity and piercing sadness of Dench&#146;s Esme are painfully sad to watch and leave much to think about long after the curtain falls.